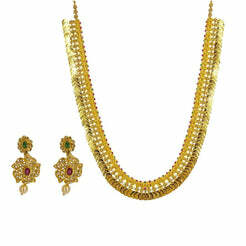 22K Yellow Gold Necklace Choker and Earrings Set W/ Kundan, Emerald & Ruby Gems for women. 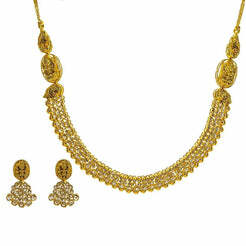 Necklace accompnied with jhumki drop earrings secured with a post screw back. Gold weight is 72.3 grams. 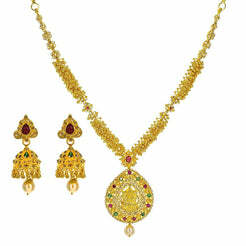 Decorated with kundan, emeralds, and ruby stones. The Necklace length isalterable with a snare Closure.